The week before the fourth of July, I was invited and able to attend a ribbon-cutting ceremony in Ketchikan commemorating the completion of a 70,000 square foot addition to the city-owned hospital. Over 300 people gathered on June 25, 2016 for the ceremony, barbeque, and tours of the new hospital wing. The highlight of the tour is the new state-of-the-art surgical suite. The largest operating room in the state is now in Ketchikan. Hospital officials have told me that the new facilities have already helped to recruit experienced physicians and surgeons to Southeast Alaska. This new addition to the Ketchikan Medical Center will benefit Southeast Alaska. 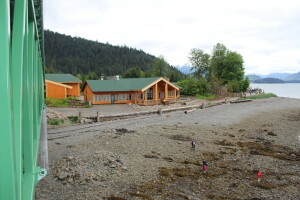 It is my hope that costly medivacs to Seattle or Anchorage will occur less frequently because of the new facilities and Southeast Alaskan families will be able to stay in Southeast Alaska. The expansion cost roughly $62 million. I was honored to be co-chairman of the Senate Finance Committee enabling me to add $20 million to lower the debt level on the hospital. I appreciate the patience of our communities with this large appropriation. This project will be very beneficial to the entire southern Southeast Alaska region. For more information on the ribbon-cutting ceremony, here is the article from the Ketchikan Daily News. I was among the individuals who were invited to the grand opening of the newly constructed cruise ship dock located in Hoonah. 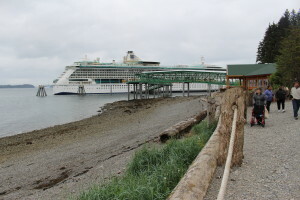 The grand opening was held on May 23, 2016 at Icy Strait Point. In 2012 when both former Representative Bill Thomas and I were co-chairs of the House and Senate Finance Committees – we were able to appropriate $17 million into this project to make it a reality. This was a great investment into the community of Hoonah and will produce dividends for the community for decades.